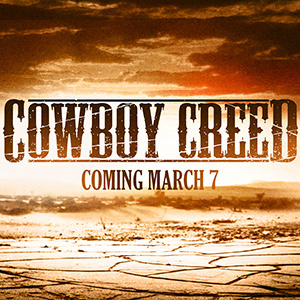 LOS ANGELES—Runic Films and Blue Seraph Productions have announced that their “mini epic” short film Cowboy Creed will be released on www.runicfilms.com on Friday, March 7th. The short Western film recently completed its festival run with two award nominations at the Action on Film Festival; for Best Western Short Film and Anthony De Longis (Sheriff Eli) was nominated for Best Supporting Role in a Short Film. A Western action-adventure written and directed by Ben Alpi, Cowboy Creed tells the tale of Phineas Creed, a young cowboy trying to find his place in a post-Gold Rush world. When the international criminal “Limey” kidnaps his ladylove Miss Graves, Phineas faces the most harrowing showdown of his life. The film stars Kendall Wells, John Carrigan, Tara Platt, and Anthony De Longis, with Leandro Cano, Wayne Webb, Tellier Killaby, and Doug Drexler. The film’s producer was J.T. Tepnapa with cinematographer Dave Berry, production designer Meg Savage, costumes by Catherine Elhoffer, editor Jeff Handy, and the music was composed and performed by Joe Terrana. Tune in to http://runicfilms.com on Friday, March 7th!